MACD fell from 6 to 0.17, while RSI which was starting to become elevated, pulled back 1.74 points to 66.76. Support is at 1072 (20-day moving average) and 1054 (50-day moving average). Resistance is at 1100 and 1110. 1100 is a key area of resistance. If the INK CIN can break above this region, we could see a nice sprint higher into the 1150 area. Gold, silver, and copper rose strongly on Friday (1.5%, 2.6%, and 3.2% respectively). And all three metals look set to continue their outperformance over the next month or so, with a few dips along the way. 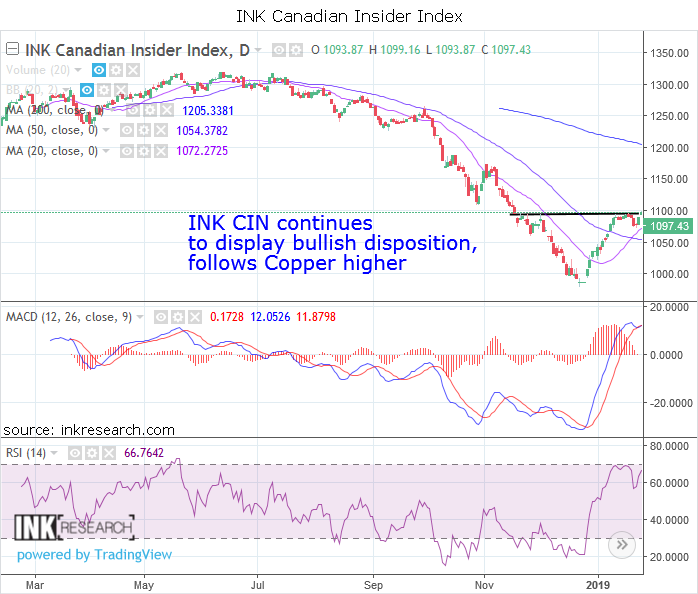 This action bodes well for the INK Canadian Insider Index which has done well when these sectors have outperformed. The INK Canadian Insider Index is used by the Horizons Cdn Insider Index ETF (HII), a 2017 Fundata Fundgrade A+ ® award winner.